Some of the more casual observers of the 2016 election cycle were probably surprised by Dr. Ben Carson’s endorsement of Donald Trump today. Isn’t Carson this quiet and civil man who wants everyone to get along? Why would he endorse a crude and divisive figure like Trump? And didn’t Trump call him a “pathological liar” not long ago? Is Carson really that steamed at Ted Cruz for his “dirty tricks” aimed at him in Iowa? Pretty clearly, being called a liar by Donald Trump is an occupational hazard of opposing his presidential candidacy, so maybe Carson is being honest when he sloughs that off as just politics. 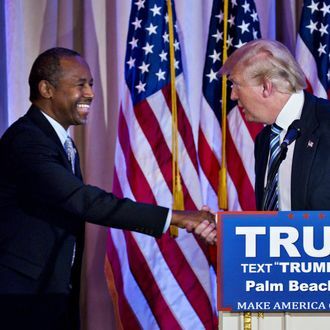 But to the discerning observer of Carson, he has more in common with Trump than mere antipathy toward Ted Cruz. Dr. Carson says that the good news is that the majority of people in this country have common sense, but the problem is that they’ve been “beaten into submission by the PC (political-correctness) policemen,” which has kept people from speaking up about what they believe. “One of the principles of Saul Alinsky, he said you make the majority believe that what they think is outdated and nobody thinks that way, and that the way they think is the only way intelligent people think. And if you can co-opt the media in the process, you’re far ahead of the game. That’s exactly what’s happened, and it’s time for people to stand up and proclaim what they believe and stop being bullied! So for a man obsessed with fighting political correctness, what could be more natural than to join forces with a candidate whose own opposition to political correctness makes him eager to offend as many people as possible? In some respects, Trump is the politician Carson probably wishes he could be. Beyond that, there is, of course, their common status as “outsiders,” which Carson mentioned at the endorsement event. This may go deeper than feeling comfortable around someone who also made his name outside politics. With zero experience in government and precious little in politics, Carson was never going to feel particularly valued in the retinue of candidates surrounded by elected officials and policy wonks and donors. But at this early stage at least, Trump’s circle of endorsers and validators is very small and not terribly distinguished (if you exclude the Hollywood types that have mostly been in Trump the Entertainment Figure’s orbit for years). For a guy like Carson, going from the tumult of the campaign to a favored place in TrumpWorld must feel like stepping out of a crowded airport concourse into a large and airy hotel (maybe a Trump hotel!) where he is one of a handful of guests. What’s not to like? If Trump wins, the sky’s the limit for Carson’s public-sector ambitions. And if he loses, there are still books to write and sell.